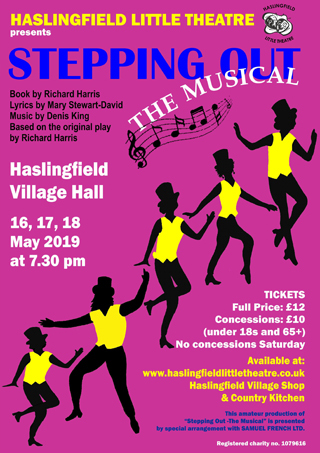 We are a vibrant amateur dramatics group based in the South Cambridgeshire village of Haslingfield. We perform two major productions a year - in May and November. We are well known for our high-quality productions, and have been nominated and won many awards, the latest being Best Technical for Costumes & Set for our November 2015 panto, Mother Goose - award to us by the National Operatic and Dramatic Association (NODA). In November 2018, we performed the classic panto, Cinderella, which included two Pantomime Dames, of course, as well as all the other characters in this well-loved story. To see some photos from the show, please click here. This hilarious comedy by Alan Ayckbourn concerned a mismatched couple on the fateful evening when the dinner party they hold for their respective parents had unexpected, life-changing and chaotic consequences. Photos can be seen here. This challenging production, with music, lyrics and book by Lionel Bart, included all the well-loved characters from this classic Dickens novel. To see some photos from this timeless musical, please click here. our May 2018 production: RolePlay. We welcome new members with or without experience – on stage or back stage.